Security is an essential part of any software-based solution. Few business processes are as sensitive to security as those related to electronic signatures. Digital electronic signature transactions usually contain information that is critical for you, your business and your customers. This information can include personally identifiable information (PII), details of prices, proprietary business terms, intellectual property, etc. This is precisely the reason why DocuSign's top priority is customer security, given that we are industry leaders defining and delivering the most secure solution for managing digital transactions and electronic signature available. In light of the critical nature of information security, DocuSign has designed a Security program that translated into a global focus led by the CSO (Chief Security Officer) and CLO (Chief Legal Officer) who propel congruent and applicable policies for all aspects of an organization. Every employee or partner of DocuSign takes an active part in the program, it be direct or supervising the application of the before mentioned policies. DocuSign has met or exceeded repeatedly the most demanding security requirements, including those required of the organizations most conscious about security, including Fortune 500 companies, major global financial institutions, and other international companies. DocuSign is the only provider of electronic signatures that has received the ISO 270001 certification. This is currently the best guarantee of the strictest and proper management of information security. 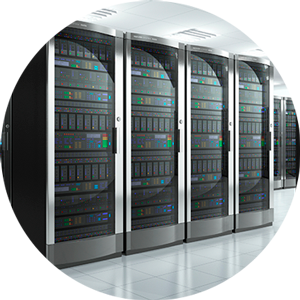 The data centres are audited periodically according to the SSAE 16 standard. DocuSign among many other security measures uses AES-256 to encrypt and store information and for private sessions uses SSL/TLS-256-bit. DocuSign has six data centres in Tier IV, geographically dispersed throughout the globe, these are located in the US and Europe. All are property of DocuSign. The centres are under surveillance 365x24x7 by security agents and with several measures of physical security in place. Likewise, the data centres are certified with the standards that guarantee the application of global best practices such as ISO 270001, PCI DSS 2.0, and TRUSTe privacy management certificate. 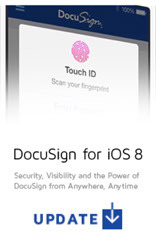 DocuSign is the only provider of electronic signatures that has received this certification (ISO 27001). It is the best guarantee of international security available today. The data centers are tested by PCI DSS 2.0 and SSAE 16 and are encrypted by the AES-256 standard and use 256-bit SSL for the transmission of documents. Touch ID™: Advanced Security for accessing your documents and the application with a simple touch of your finger. Signature extension: You can access and sign a document from any application without having to exit it. Instant status of documents: One of our most popular features is now available for the mobile app. 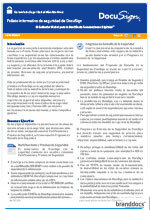 Instantaneous status of the documents, with which you get the full picture on who has signed and who still has to sign. You can send reminders and with a simple swipe of a finger you can delete the document.